Did you know that Hollywood superstar Jennifer Lopez, also Queen of bling, is designing a range of sparkly jewels for dogs? Honestly, do these people not have enough to do? I’d give her a pinny and a broom and tell her to get started cleaning out up at the top of the garden if she came round here with her silly ‘I’m going to design jewellery for dogs’ idea. Anyway, I just thought I’d bring you a bit of international news with this week’s babble. I couldn’t possibly tell you what’s happening in the House of Commons at the moment, or what eight men are going to be doing with Glen the Eagle in Scotland next week but I can tell you anything you need to know about celebs. Delia gives me a fresh newspaper every day and before I, you know, do my business on it, I like to read all about the likes of Britney, Prince Charles and Terry Wogan. Enough about them and a bit more about us. Soon, this website is going to be brimming with Bobtails’ beauties, and I’m not talking about our bunnies. Jim and Delia thought it would be a good idea for you to see some of the lovely laydees on the website who help us out here at Bobtails. I thought it would be fab if we could do it Miss World-style.......’And here is Miss French lop, also known as Claire Simpson, modelling a Bobtails bikini. She would like world peace and free bus passes for northerners....And here we have Miss English, also known as Conrad, modelling painting and decorating dungarees. She would like world peace and one-way tickets to the north for all northerners’. Delia said it was a terrible idea and people would start to think I was a dirty old perv bunny only interested in laydees. She also said I must apologise to northerners at once because they are very lovely people (once you have translated what they’re trying to tell you – I say). In all seriousness, we will be bringing you more details of our dedicated volunteers who do a fantastic job – including Conrad, who in fact is a man and not a Miss as previously stated. Only joking mate. I’ve been a sensitive old soul these past few weeks helping my good friend Laura revise for her A-levels. Instead of chewing paper, weeing on books and generally being a pain in the rear, I have been a loving, caring bun giving out lots cuddles and attention. It’s a tough time for teens like Laura and I think we should all find a teen and give them a hug – just keep your hands off Laura, she’s all mine. I love her very much and will really miss her when she goes to Uni. Do you think I can go too? I can just see it now – Mr Scruff the student. Punk hair, Dr Martin boots, pretend piercings and Nirvana records. Back to business Scruffy – right, next on the agenda is food. I was put to bed the other night without my food. She shut me in my secure cage and left my plate of food on the table. I was livid. I was in the cage, with no way out but I could see my food on the table. ‘What would James Bond do?’ I thought to myself. After a thorough search of my person for James Bond-type devices (no exploding watch or extendable pens) I decided I would have to force my way out of my cage. Like a jack-in-a-box I burst through the lid of the cage and was out – free. I stomped over to the table and was reaching for the food when she came rushing over to check I hadn’t killed myself in my amazing daredevil stunt. Of course I hadn’t and the only thing hurting was my starving stomach. She won’t forget to feed me again in a hurry. Meanwhile, spoil sport Jim has fixed a few extra clips to the roof of my cage – no more escaping for me. I’ve time to mention this one little bun before I turn in for the night. We’ve had an absolute darling of a rabbit through the Bobtails’ gate this weekend. 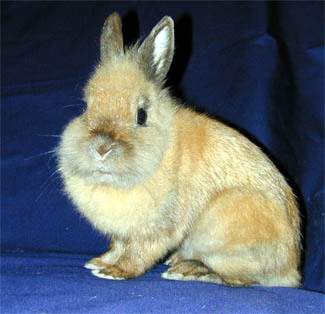 Her name is Bluebell and she will make a fabulous pet for somebunny special. Her owners didn’t want her anymore, and instead of ringing up a rescue to see if they could take her, they opened her hutch and left her to make her own way in the world. How she survived the foxes and cats in her neighbourhood I’ll never know. Anyway, some kind soul rescued her from his garden and brought her to Jim and Delia. She’s a tiny agouti/lion head cross and is about eight to 12 months old and we should, technical Jim permitting, have a picture of her with this scribble. And finally, as they say on the news, I’ve had my first piece of fan scribble this week from Flossie and Einstein house bunnies in Hampshire. They went to stay at the Doe Drop Inn (mentioned last week) and had a fantastic time, living the life of luxury. If you go to our links page, you can follow the Doe Drop Inn link and see their photos under The Boarders. Right, my paws are getting tired now, so I’ll be off for a doze. Don’t forget to nudgey cuddle a teenager and remind your owners that the best place for food is in your tummy – not on top of the dining table.